I have a folding plastic chair that I keep near the horse paddock, home to a small family of six horses. Many times a week, I hoist the chair over the railing, unfold it in the middle of the enclosure and just sit. It’s the perfect way to not only ‘share territory’ with my equine companions (a deceptively simple but potent training technique), but to observe their behaviors. Sometimes things are tangibly still, like sitting inside a Tibetan monastery. Sometimes, things are moving—one horse pushing another with silent subtle gestures, which leads to the movement of others—a sea of to and fro. At other times, things are playful and robust, with dust flying and giant bodies tumbling and arching. Sit around and watch the horses long enough, and you notice a deliberate regularity to their behavior that serves a common purpose of safety, peace, joy and success. The horse herd is a 40-million-year-old system that not only succeeds, it thrives. This endurance defies the conventional definition of ‘sustainability’ and invites us to learn something from these powerful, wise and sensitive animals. Allegorical use of horses as a window into the management of our own social organizations may seem at best romantic, and at worst a cheap stretch. We are not animals, we tell ourselves, and our brains function differently, and besides, horses can’t balance a budget. But this thinking not only over estimates our superiority, it underestimates the intelligence of nature. And, in fact, as mammals, our brains are hardwired for the same need for safety and success as the horse. It is our nature-deficient culture that robs us of true insight, robbing us of wisdom that could prevent professional and organizational demise. According to Arie de Gaus former executive with Royal Dutch Shell and author of The Living Company: Habits for Survival in a Turbulent Business Environment, the average life expectancy of a multinational corporation—Fortune 500 or its equivalent—is only between 40 and 50 years. And the people working inside these organizations fare even worse. Top-level executives increasingly experience depression, anxiety, burnout and breakdown. Estimates are that over 50% of executives have experienced depression, and rates are estimated higher for those in top leadership positions. But statistics for professionals are nearly impossible to come by due to the stigma surrounding the topic. Our culture defines a limited way of leading and being in organizations. With its dominant, hierarchal, hard-fisted, do-more-with-less, might-means-right world view, our lens through which we imagine a successful organization is distorted. And without clear seeing, we see no way out except through prescription medications. Such distortion dictates historical accounts, scientific assumptions and education, and hence perpetuates itself. So when we look to the horse for wisdom, we realize that it even cloaks the truth behind true herd behavior. We are told, for example, that a herd is governed by a roguish stallion, who runs his ‘harem’ of mares across hill and dale (yes, ‘harem’ was the actual word of choice used to describe the herd in an equine behavioral science book published in 1952). But peer into the horse kingdom with clear eyes, free from the mythical cultural overlay, and you will discover that something quite different is happening. Herds operate in what is referred to as a ‘moveable hierarchy’, that is, that the leadership shifts and moves depending upon the need of the herd. Often it is a mare, or a team of mares who govern the herd, and a stallion (or gelding in a domestic herd) might also share this position with the mare(s). The mares determine the ‘right place’ for each member of the herd based on each individuals temperaments, gifts and weaknesses, and they are responsible also for disciplining those who behave in bullying or anti-social ways. Contrary to folktale, the herd is not there to serve and bow to the dominant’s whim simply because he is ‘boss’. Instead leadership’s goal is to serve the good of the whole. It’s premise – care, love and safety. Terms like ‘boss’, ‘pecking order’, ‘survival-of-the-fittest’, to describe herd dynamics, obscure the profoundly nurturing and relational nature of this arrangement. The immense power of the herd is accessed not through what we would conventionally coin as ‘strength’, ie, toughness, might and ferocity, but instead through its sensitivity—empathy, listening and quiet presence. Imagine if, as children, we were told the truth about the herd, how that might have differently informed our sense of true power. How does it all work, and how can it work in an organization? In order to liberate power, the herd has some very specific emotional and psychological needs. The needs are interdependent, and when applied to organizational dynamics, liberate all kinds of capital not only for the organization, but for each member. The needs are: congruence, sense of personal space (a right to be here), leadership, relationship, and place (belonging). Congruence: Non-predatory animals are acutely sensitive to truth telling. Their lives depend on it. A mountain lion lurking in the bushes, wanting to pounce on the herd, registers to them as ‘incongruent’. He is pretending he is not there. He is aiming to be invisible and unthreatening, yet aiming to eat a horse. To survive, horses must have such a keen sense of their surroundings. They can feel a predator 500 yards away, AND feel that predator’s intentions. One has to appreciate this capacity for extremely subtle nuances of sensitivity. If they only felt the predator’s presence, and were not be able to discern his intention, they would be fleeing unnecessarily, expending precious energy, all the time. If we go out to catch a horse, with our halter behind our back, acting as if we want nothing from him, he’ll register this as incongruence. We are the same way, if a leader promises to protect our local library, but is secretly shaking hands with a real estate developer who has eyes for the property, we feel something’s up. We register incongruences all the time, but we talk ourselves out of them. No wonder modern culture experiences increasing rates of chronic anxiety. Incongruence is a threat. And without congruence people, and horses, feel existentially unsafe. But there is a deeper nuance to congruence here that is essential: to be as one is, in any given moment. This is a state of being that is about being fully present moment to moment, without some subtle contraction to change it, alter it, judge it. If I am anxious, I let the anxiety live inside me without panic. If I am bored, I allow it to be. This may sound radical. ‘But,’ you say, ‘if I let myself just be anxious, then nothing will change!’ This is a trick of the mind. Change only happens through real presence, peace and calm. And being panicked about our anxiousness hasn’t changed anything except make us more anxious. In learning to be congruent, we learn to tell ourselves the truth. I suggest this practice to my clients: each day, all day, tell yourself the truth. Please note: this does not mean that because you’re telling yourself the truth, you now have to share it with others, or make radical changes externally. Pressuring yourself to do that undermines your practice because it will make your task seem too overwhelming. No, just keep with a simple internal practice of telling yourself the truth. Is your body telling you that you are sitting down to coffee with someone you’d rather not be with? Just notice; tell yourself the truth. Is your gut telling you to be weary of that new girlfriend? Just notice; tell yourself the truth. With our clients, working to master presence and congruence is a fundamental practice that underlies all of our other work. And here the horses are expert teachers. Horses (and people) need to feel that those around them are congruent – telling the truth (and telling themselves the truth). Here again the dominant cultural paradigm misleads us. Many of us were told, ‘Don’t let a horse know you’re scared or he’ll take advantage of you.’ Again, another tale. Horses don’t mind fear, or anger, or frustration or dislike. What causes them concern is when we are feeling a so-called negative emotion and not comfortable with it. That registers as incongruence. The tale is based on a misunderstanding—most people are uncomfortable with fear, and it is that incongruence that makes a horse mistrusting, not the fear. In our work at the Institute, we coach our clients to be emotionally courageous, to be able to bear and be fully present with their entire range of feelings and emotions. They then cultivate that skill to apply courageous presence with others, and thus wield a powerful, effective, confident and positive influence especially in high anxiety situations. Of all the needs, congruence is the most fundamental. Without congruence, all other aspects to herd safety are compromised. It is exactly the same with human beings. In order to feel safe, we need to feel congruence within ourselves, and externally. Without it, we begin to feel stressed, and in chronic cases of incongruence, we can become ill. Sense of personal space and right to be here: Through being congruent we know and befriend ourselves, and gain a sense of our right to be here as is. This comes quite naturally to horses; it would never occur to them that they were worthless, had no right to be here, shouldn’t take up space, should be different, or should not get in the way. Spend time with horses you’ll get a sense of their unapologetic presence and their unambiguous solidness on the ground. You’ll also notice that each one maintains a sort of cushion of air around them through which they negotiate their personal space. Through this larger cushion of air, they in fact take up more personal space than their actual physical body mass. When people allow themselves a similar ‘cushion of air’ around themselves (energetically, emotionally and metaphorically), many positive things happen. They feel more present, more sensitive, and more aware of other’s crossing their boundaries. They are also more aware of others’ personal space, energetically and emotionally. They feel more confident too. 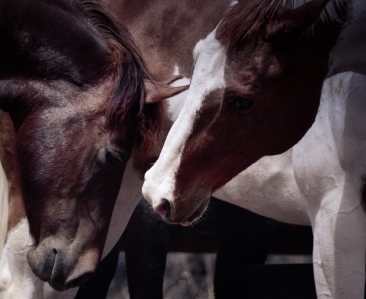 It would also never occur to horses that they were separated from all of life. Culture distorts this knowing for us, and leads us to imagine we are disconnected from all things—individual solitary silos, aliens and imposters—which leads us to either ‘play small’ by pretending to have no influence or ‘play big’ by wielding overbearing influence. Knowing we belong to and are connected with all things gives us more confidence to safely, unapologetically just be here, present, and grounded without any unnecessary egotistical props. Leadership: Again, our culture gets it wrong with the herd. We are told the lead horses are dominant, when in fact the two are very different. Dominant horses are the ones who disrespect boundaries and are bullies. Because of their behavior and unless they are corrected, they tend to be isolated from the group altogether. Naturally, no one wants to follow them. The lead horses are the ones who display alertness, a keen sense of their surroundings, and a respectful kind but justly firm presence that establishes and protects all members’ place in the herd. Unfortunately, human dominants tend to procure leadership positions (due to our tolerance for incongruence), hence our confusion around leadership. This leads to organizational misbehavior, irresponsibility and poor public policy. It’s a shame, because such a culture discourages those more sensitively inclined to take leadership positions where they are most needed. Many good hearted, wise, sensitive professionals who come to us are ambiguous about concepts of leadership, power and influence because they imagine it to belong in the domain of the dominants. This is a gross misunderstanding and is leading us down a dangerous path. The key behind true leadership is not dominance but justness. Horses teach people how to be excellent leaders because they respect nothing short of justness, along with clarity, presence, genuine care and the willingness to make requests. And in fact, they will constantly test their human students to see who is the leader—the horse or the human—not because they are ‘vying for power’ or ‘needing to see who is boss’, but because the safety of the herd depends upon it. When a client steps into his or her leadership role with their horse through making clear requests, the horse is instantly soothed and calm. Why? Because requests mean they are being taken care of. Relationship: Horses become stressed and depressed when isolated. They need each other to thrive. It is sad to note that it is a common practice in North America and Europe to board horses in stalls, or loose boxes, separate from one another. But we do the same with ourselves as well. We go it alone, isolate when we feel frightened or overwhelmed, and create organizational structures that discourage truth telling and thus encourage isolation. It may look like we are all together, but we are alone together. Much more can happen in the creative synergies of authentic collaboration, supportive community and creating allies around us who hold us accountable to our authentic best. Place: Through leadership, requests, relationship and congruence, every horse in the herd has his right place so that he can best joyfully thrive and contribute to the wellbeing of the others. Some horses are more comical, and provide entertainment and play, some more pensive, others have immense curiosity. In Jim Collins’ bestseller Good to Great, he makes the well known bus analogy. “First get the right people on the bus, the wrong people off the bus, and the right people in the right seats and then figure out where to drive it.” This is not cutting edge thinking, this is 40-million-year-old wisdom. The herd is constantly moving towards placing the right horse in the right seat on the bus, and establishing the right direction to drive it. Hmmm, that’s a strange image. But anyway, you get it. To move forward, we need to wake up and see that our culture is based on a fair share of ‘husbands tales’, and also a dominant predatory paradigm. While the predatory paradigm has its place (there is nothing wrong with predators—in certain circumstances bringing out the lion within is acutely necessary), it was never meant to be the whole story. It only accesses half of our capacity. Human beings are omnivores, not just predators or just herbivores, and so we have within us the capacity to engage in both predatory and non-predatory approaches to power. Having the capacity to make an informed, wise, deliberate choice between our capacities poises us for greatness, and the possibility for making real, sustained and responsible change in the world. This article originally appeared in EQUUS and is republished with permission. EQUUS is an innovative self-mastery and inspired leadership process for individuals and organizations whose work has been validated by thought leaders of the business community around the world, and recognized as a key differentiator in the art of teaching essential yet elusive organizational and personal change concepts.